Read more from contented parents whose lives have been transformed because they discovered Haberman's feeding innovations. "We had found the answer. I will never use a different bottle and have been able to recommend these to other mums, especially ones who are thinking about combination feeding." To download and read more click here. 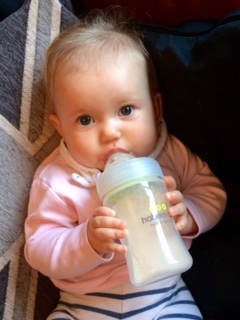 "They are amazing bottles - my baby is nearly 6 months old, solely breastfed and I couldn't get her to take a bottle but within 2 days of using your bottle she is drinking like a trooper. "Our daughter Charlotte was about a month old when she started to have stomach pains every time that she ate. We spoke with the doctor to determine that gas was the culprit but could not seem to find a solution to help mitigate the gas. My husband and I tried to use different bottles, formulas, gas drops, gripe water, and exercise to no avail. Then we heard about the Haberman bottle. As soon as we received the bottles in the mail we started using them and Charlotte felt better after the first feeding. While the gas was not entirely mitigated she was much more comfortable. We no longer had to stop in between feedings due to gas pains. We soon noticed that Charlotte had more control over the flow of milk. She also was more active during the feeding which meant she could eat comfortably at her own pace. We no longer had to worry about excess milk dribbling out of her mouth and down her neck during feedings. The feeder eliminated this annoyance. She is now three and a half months old and is feeding well. We will never use another bottle for Charlotte or any other children after our experience of using the Haberman Suckle Feeder."